I have finished The Blues crochet blanket! I absolutely love this one, I think mainly because one of my favourite colours is blue - and I just think that this one with the different blues all bordered by white look so fresh and pretty! I think Trixie agreed with me. Trixie is one of our cats. She's a petite tortoiseshell with the hunting skill of a tiger! 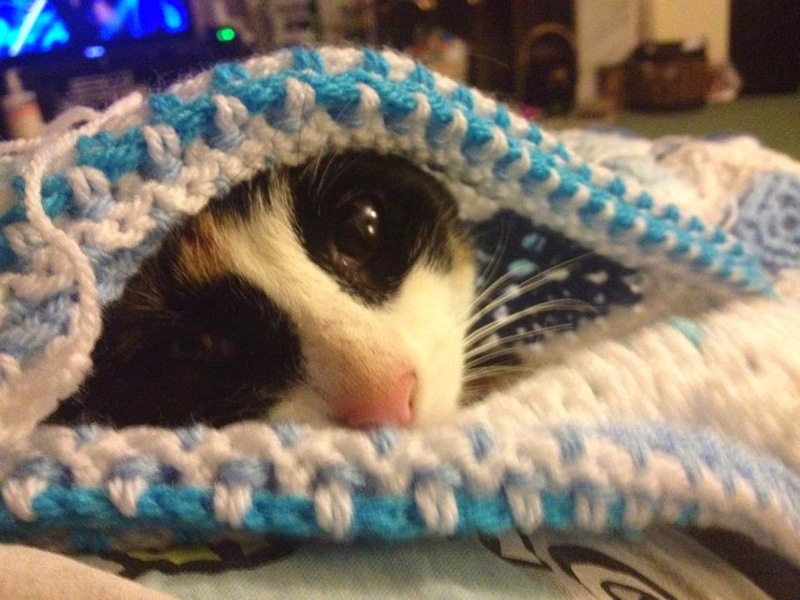 She has become quite partial to this blanket and "helped" me several times with the border and the sewing in of ends! The Blues is now ready to go into The Crafty Phoenix Lady unit at The Emporium ... hopefully to find a new owner soon. I have also posted it onto my Etsy page as a product that can be ordered and made up especially by ME! That way The Blues is "out there" in two places! Oh and I've also "pinned it" on my Pinterest board - The Crafty Phoenix Lady. Doesn't she look so sweet here?! Honestly you wouldn't believe what a demon she is - and the little dirty stop-out has had two nights' out this week and not come in for her supper and bedtime!